LIFE is an EU joint-funding mechanism which is used for work within the Natura 2000 network of protected areas. We therefore selected eight Natura 2000 areas in the east of Luxembourg which cover much of the remaining calcareous grassland and juniper formations in Luxembourg. Sites which fit this bill in Luxembourg are to be found in the south of the country, associated with the Jura chalks of the Minette, and in the middle and eastern Gutland, associated with Keuper and Muschelkalk formations. 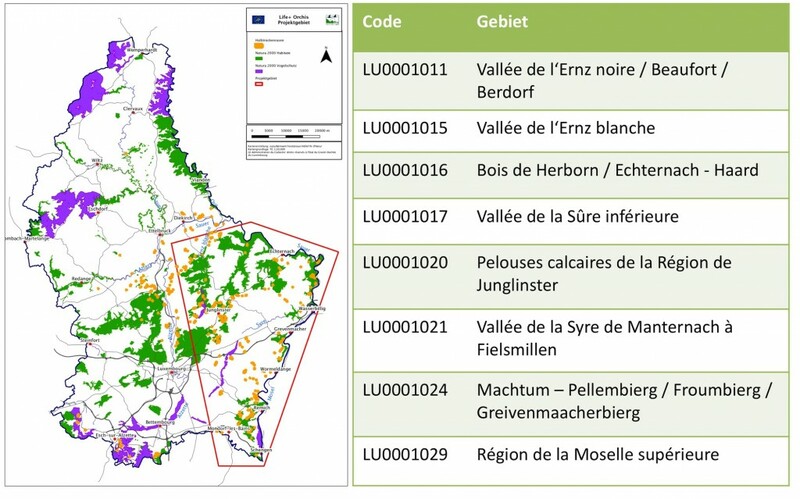 Most of the calcareous grasslands associated with the erstwhile opencast mining areas in the south of Luxembourg are already covered by work being done by the State Nature Administration and SICONA West. The LIFE ORCHIS project therefore focuses on the calcareous grasslands contained within Natura 2000 areas in the east of the country.